When JetBlue took flight in 2000, the company aimed to "bring humanity back to air travel." The team started by ordering a bunch of new Airbus A320 aircraft, filling them with comfy leather seats (and enough legroom), serving unlimited free snacks and, best of all, offering a TV at every seat with 20 channels of live satellite TV. Part of this exercise in "humanity" involved keeping ticket prices affordable for everyone. Fast-forward 14 years later, and the airline is bringing this approach to first class travel with the introduction of "Mint." Until now, first class and even business class weren't accessible to everyone. Maybe you've been lucky to sit in a premium cabin because you're a frequent flier with status on an airline like Delta. Even then, the upgrades aren't always guaranteed. Or maybe you're rich and have stacks of cash to buy first class tickets at full price. Good on you, then! But, even if you've flown first class elsewhere, JetBlue's new Mint cabin is unique. That's partly because it uses some innovative technology, but also because it's actually affordable. 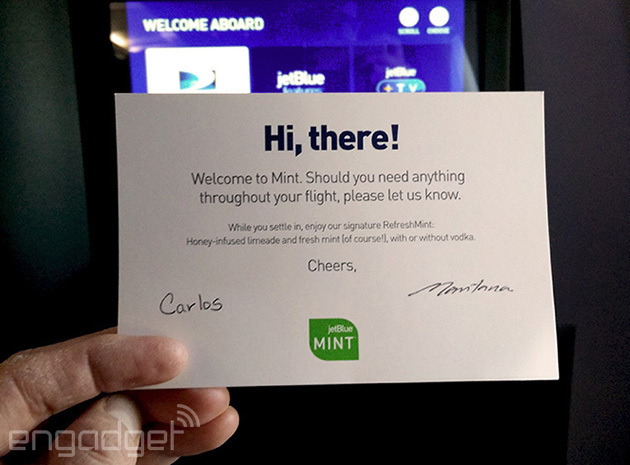 Introduced in June 2014, Mint is what JetBlue calls a premium service "minus all of the stuffiness often associated with the front-of-the-cabin experience." In other words, this isn't your parents' first class. In fact, you won't see anyone at the airline refer to it as a "class." You'll also only find the service on flights aboard the airline's new Airbus A321 aircraft from New York (JFK) to Los Angeles (LAX) and San Francisco (SFO). I boarded and sat down into seat 1F, greeted by a large blanket and a personal note card from the two flight attendants, Carlos and Montara. Though I expected to walk into a mint-scented cabin (admittedly that'd be a bit much), I was immediately offered the airline's new signature pre-departure cocktail with honey-infused limeade, fresh mint and vodka. Montara then went on to explain how to use my seat, which could be customized in an almost infinite number of ways. If I wanted to make my seat into a lounge chair, I could press "relax." To sleep, I'd press "bed," or mix and match the options until I was totally comfortable. Should I have decided to sleep, my six-foot-one, 235-pound frame would have been rather comfortable, as the lie-flat bed measures out at six feet, eight inches, while the seat itself is 22.3 inches wide. JetBlue claims both measurements are the longest (and widest) in the domestic "business class" market. And while I was seated with a passenger to my left, the cabin offers four "private suites" including a door for those seeking solitude. Once we took off, I needed to get right to work, so I plugged my laptop into the dual 110-volt power outlet and my smartphone into the USB port, then connected to "Fly-Fi." When we first tried out the service in November 2013, it was pretty fast and blew typical Gogo speeds out of the water. Unfortunately on my flight, it wasn't quite as zippy. Using a couple different tests, I saw between 0.50 and 4 Mbps throughout the flight, and stalled over Nebraska. Eventually, it picked back up and still felt speedier than Gogo, but wasn't quite as brisk as expected. But then again, Louis C.K. reminded me that flying is a miracle. Granted, this was the week Kim Kardashian's Paper Magazine cover came out. While JetBlue is a ways away from fleetwide access to Fly-Fi (it promises to have all its A320s done by the spring of 2015 and its E190s soon after), the service promises to be better than its competitors, so I'll hedge my bets that it will get stronger for travelers in the future. Granted, this was the week Kim Kardashian's Paper Magazine cover came out, so maybe she did "break the internet" -- specifically, the satellites that would beam her to our flight. Maybe the Fly-Fi challenges were a sign that I should put my laptop away and soak in the experience around me, and perhaps pay some attention to the 15-inch screen in front of me. I flipped through the channels with my in-seat remote and landed on Bravo's Real Housewives of Atlanta. You know, the episode where we catch up with NeNe Leakes as she conquers the Cirque du Soleil's Zumanity stage in Las Vegas. If you've flown JetBlue before, you've likely seen a smaller screen offering 36 channels of DirecTV to watch. This newer model offers 100 channels via DirecTV, 100 SiriusXM channels to listen to and some additional interactive content to flip through. 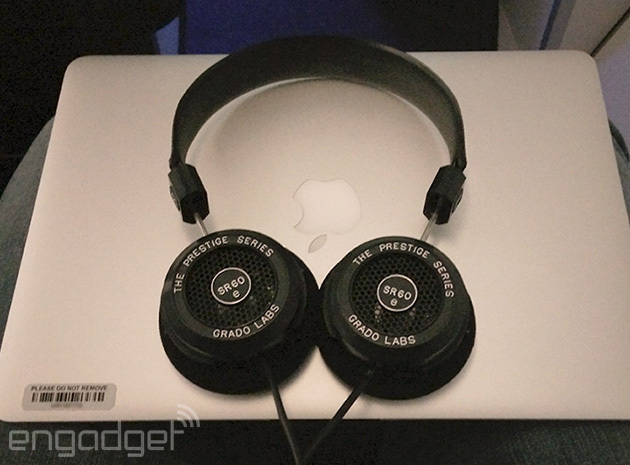 Also, every Mint guest is offered a handmade Grado SR60 headset to borrow during the flight, which felt quite nice on my head and sounded great, too. For even more entertainment, JetBlue also recently announced the launch of its "Fly-Fi Hub," offering select TV shows on-demand (with movies to come next year), accessible from your own device. Today, movies for purchase on the screen operate on a rolling channel and aren't on-demand. 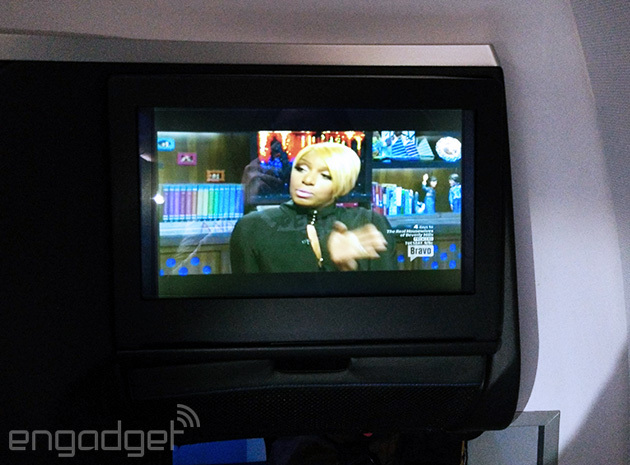 If you caught our explainer on the somewhat complex world of in-flight entertainment a few months back, you might consider it JetBlue's take on Gogo-equipped airlines like Delta, which offers streaming content to personal devices in-flight. Personally, though, I'm much more into the live satellite TV content than anything cached. Upon takeoff, I was handed a menu that explained the meals offered on the flight. The entrees are served tapas-style and are conceived by New York's Saxon + Parole restaurant. You're also offered an "amuse-bouche," which, honestly, I had to consult Google and a dictionary of French restaurant terms to learn that it's an "appetizer or cocktail snack." For dessert, JetBlue kept that mint theme up: some fresh fruit and a cup of peppermint ice cream from Brooklyn's Blue Marble Ice Cream. 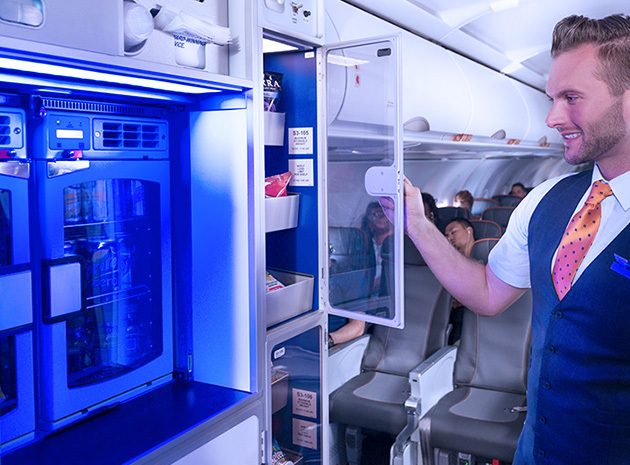 If I had been itching for some of JetBlue's classic snacks, such as Terra Blue potato chips, there was also a self-service "galley" in-between Mint and the main cabin that offered plenty of snacks and non-alcoholic beverages for passengers to take whenever they felt peckish. On the way out, we were handed a small box of pastries from Mah-Ze-Dahr to take home as well. I saved that to enjoy with some vanilla ice cream later that weekend. *Prices as of 8:00 PM PT on November 30, 2014. If you prefer to stick to JetBlue's main cabin, you're still going to have a great trip. In newer Airbus A321 and A320 aircraft that the airline takes delivery of, travelers will find a refreshed main cabin. It features beautifully refreshed seats with movable headrests (something JetBlue didn't offer before). The seats will also come with a 10-inch version of the screen I had up in Mint, with the same content. Starting next year, the company will retrofit older aircraft with the new cabin design (minus Mint, which as a reminder, will just be on Airbus A321 aircraft). While this new service offering is really aimed at business travelers bouncing among Los Angeles, New York and San Francisco, it's accessible enough for a lot more people to give it a try. And knowing the airline business like I do (I worked for one in a past life), pricing is king and I could see Mint changing how other airlines approach the cost of premium travel. And while JetBlue was late to the WiFi game and introducing a premium cabin (while airlines like Virgin America came along with both of those things in its first year), sometimes patience makes the end result even better.